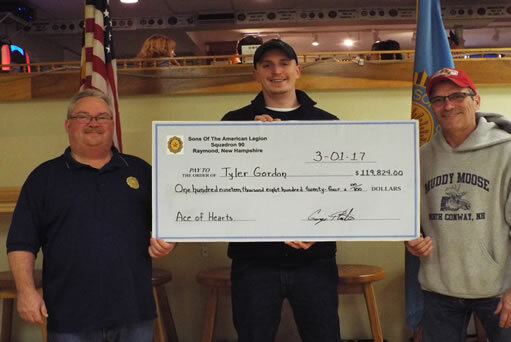 The American Legion has been holding the Ace of Hearts game for 13 years and it is the largest fund raiser the American Legion Post 90 in Raymond holds each year. They start with a deck of 52 cards plus the joker. Each week raffle tickets are sold for a dollar each and the money in the pot keeps on growing from week to week. The person whose ticket is selected on Thursday night gets to pick a card, hoping it’s the Ace of Hearts to win the money. Once a raffle ticket is pulled and there is no winner, all the raffle tickets sold for that week are thrown out, and they start selling new tickets for the next week’s drawing. If the winner pulls the joker card out of the deck, they get $100 and the joker is put back into the deck until it gets down to 10 cards. The joker was pulled twice this time around. In the latest series, each week the excitement kept building along with the pot of money, as they got down to five, four, three and then two cards. Amazingly the very last card was the Ace of Hearts. With just the Ace of Hearts on the table, it meant anyone who bought a raffle ticket from Feb. 16 to 23, prior to the drawing, had a chance of winning. On Thursday, Feb 23, the lucky person was Tyler Gordon, a 22-year Legionnaire from Madbury, who incidentally bought $100 worth of raffle tickets that night. Gordon said it’s the first time he has ever played Ace of Hearts. Presenting the check to Tyler Gordon are Bill Malette, on the left and George Plante on the right. The amount was up to $119,824 but the winner does not get the entire pot. The American Legion must withhold 25 percent for taxes paid directly to the IRS. The winner is then responsible to pay the remaining taxes due on their winning on their own. Gordon’s total winnings were $89,868 after taxes, and he was given $5,393 in cash the night he won. Gordon returned on Wednesday, March 1 for the remaining amount in a check for $84,475. When asked what he planned to do with the winnings, he said he was just going to bank it and let it simmer.